Home > Products > Wardrobes > Large Size Wardrobe with Easily to Install Within One Minute. High Quality Photo - Large Size Wardrobe with Easily to Install Within One Minute. Large Size Wardrobe with Easily to Install Within One Minute. 1).A broad range of storage space can stock many products (like clothes, toys, shoes etc.) 2).Made of high-grade&tailor-made material to ensure durability and not easy to fade. 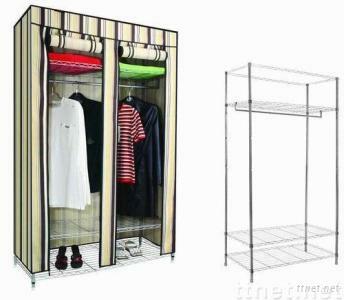 3).Double duty(can also be used as clothes rack in outdoor when remove cloth cover). 4).Customized size and designs are accepted.